Contains all the food and items you have collected. The 12 slots within the inventory frame shows the content of the current page but there are multiple pages of the inventory, to change page you simply click the big arrows at the bottom of the frame. The name of the current page is presented at the top of the frame and can be changed, simply click the pagename and press change name. The number of pages available depends on how many slots the dragon has unlocked, essentially the dragons carrying capacity, which can be increased. If a slot is locked a lock icon will be shown. Move To: lets you move the item to a specific page. Drop: Used to destroy an item. Add Note: If you find out anything about a certain food and wish to remember your revelation, you have this option, enabling you to save up to 4 notes. Upgrade: Allows you to merge three fooditems of the same quality and type into one fooditem of that type but with a better quality. Where you place the food you want to feed your dragon, when you’ve filled these slots, you feed your dragon by clicking the feed button. This bar indicates your dragons current hunger and how much the hunger was reduced by the food you gave the dragon. Allowing you to overview all your dragons current unlocked traits in a list. The main reasons why you want to feed your dragon is to lower the dragons hunger and to unlock powerful genetic traits. The dragon learns better with a full belly, thus increasing the amount of experience gained when your hunger is low and the genetic traits all have their own affect on the dragons performance throughout the game. Press down on an item/food and drag your finger across the screen to finally release it where you want to move it. When you have put food in all the food slots, you can feed it to your dragon using the feed button. The results is then presented in the hungerbar at the top center of the screen and if any genetic traits where unlocked they will appear on the right side of the screen. Remember that dragons demands variation, so you have to use different food in every slot. All dragons have their own preferences regarding food types, the different foodtypes are: Fish, Shellfish, Greens, Berries, Meat, Eggs, Intrails & Mushrooms and all of them decrease your hunger with different magnitude. By trying different meals and keep an eye on the hunger bar the player can figure out how to best feed his/her dragon. All dragons have their own genetic code, meaning that their genetic traits are triggered by different foods. All foods holds several effects, each of these effects can potentially trigger a genetic trait to unlock in the dragon, but for these traits to trigger, the effect must be combined and create a synergic reaction with the same kind of effect from another food. How you place the foods in the food slots affects the results because the synergic effect can only occur between foods horizontally or vertically aligned to eachother. Every food fed adds a hunger reduction value depending on foodrarity and the the total sum is then multiplied (stacking) iteratively by each percentual food preference bonus from all the foods, which can create a leverage effect. The preference bonuses mainly have a positiv effect on hunger, but a few food types has a negativ effect. The decrease in hunger is also dynamic depending on the dragons current hunger, meaning the total result (including all bonuses from rarities and preferences) are reduced by a percentage, the lower your hunger the bigger this reduction is. Traits have dynamic strength meaning that when these traits are unlocked, their potency & level are determined by the quality and rarity of the foods that triggered the trait, but luck also plays a major part in determining the traits level. The bigger part of the result is constant ensuring great results when the player takes rarity and quality in account. The random part of the result is also dynamically affected by the food rarity and quality, but quality only comes in to play when the overall quality is very good. One higher food rarity gives substantially more bonus than one higher level of quality. Finally the number of foods in one horizontal or vertical line that triggered the trait plays a big role in determing the results. A trait can be triggered multiple times if synergy is created between different food combinations and if so, the best of those triggered traits will be unlocked for the dragon. 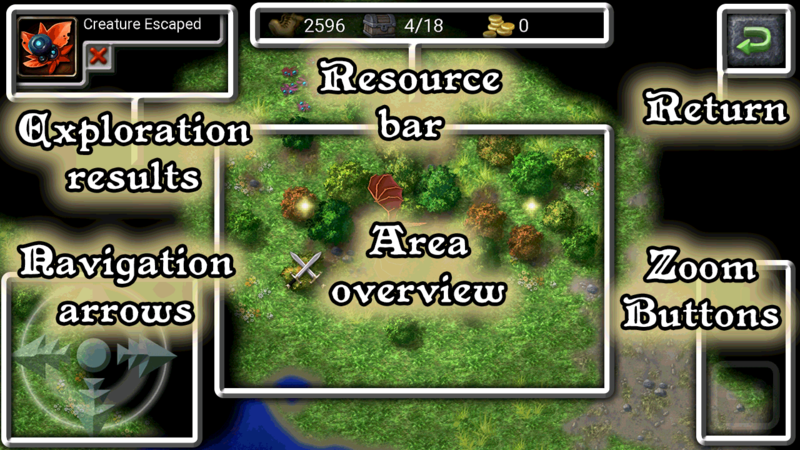 Lists the available amount of the three turn point types, Action, Movement and Battle-points. Every third hour all players dragons replenish some of their points. Action points are consumed when training in the train-mode, Movement points are consumed when the dragon is exploring the world and finally Battle points are consumed for each battle the dragon engage in. The max amount of points that can be stored is determined by the dragons level. If your dragon is fully replenished when all dragons gets replenished with new points, those points or the remainder of the points is stored by the server and will be given to you fully or partially at the next time dragons are replenished if possible. You can never loose these points. The replenish rate of these points are higher for new dragons until they have replenished the same amount of points as the veterans have replenished through the lifetime of their dragons. Finally the statpoints are the points you distribute in different attributes of the dragon to increase its power. Lists the levels of the main stats, Physique, Mind and Spirit. This is the chosen name of your dragon, you must register to set a name for the dragon. Beneath the name you have your dragons maturity and type. Your dragons maturity is determined by its level. Shows your dragons current Level, the level is one indication of the dragons strength because everytime your dragon reach a higher level, you get three statpoints, that’s used to increase the dragons power in different ways. For each level the dragon needs to gain a certain amount of experience in form of points to reach the next one, the bar beneath the level number indicates how far your dragon has progressed on the way to reach the next level, when the bar is full you reach a higher level and the bar resets. Shows your dragons current hunger represented by a percantage from 0-100%, the hunger can never surpass 100% , and the dragon will never die of starvation. But the it learns better when fed properly and when you keep your hunger in check. The lower your hunger the higher bonus on the amount learned from its experiences. If the hunger goes over 90% the dragon has no bonus and to reach the highest bonus the hunger must go below 50%. This number represents the dragons vision meaning the number of “rings” of hexagons visible around the draon on the world map in the explore mode. the dragon vision can be increased by raising the mindfullness stat. Opens up the stat mode where you distribute statpoints in different attributes, statpoints which are given to you when your dragon reaches a higher level. Opens up the customize mode, where you can choose appearance of your dragon. 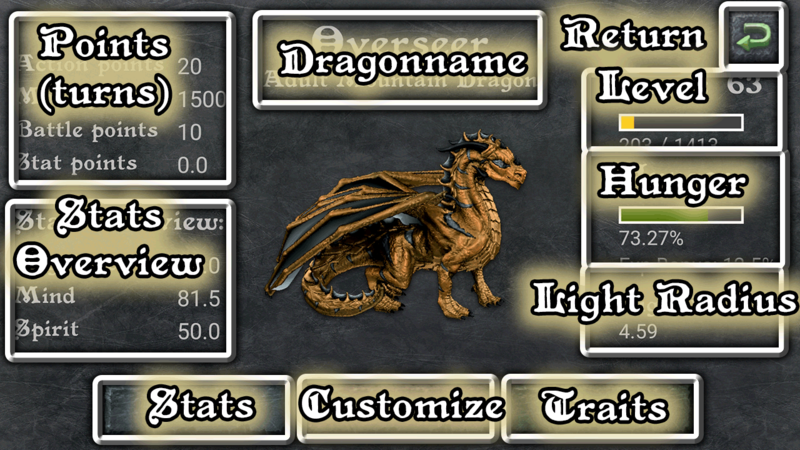 Opens up the trait mode, allowing you to overview all your dragons current unlocked traits in a list. This mode lets you enable or disable music and/or sound by simply clicking the square boxes. To adjust volume, use the minus and plus buttons. The mode also offers the player to choose whether or not to recieve notifications on the device when challenged to a battle and/or when your dragon replenishes new points these but only when the game is kept open in the background. Clicking a notification takes you back to the game. The settings are saved as soon as you return from this mode. It’s important to register your dragon to ensure that you can login, if you should re-install or loose your device or if some error occur with the login file. Name your dragon, choose a secure password and use a valid email adress to start the registration, then you verify your mail ( for your own security ) by writing down the code that where sent to the mail you used. When the server approves the code the registration is complete. Here you find the developer and composer behind the game along with some great sound artists that shared their work in the freesound.com community! The Dragon Overseer community, just register a discord account ( if you dont have any) and then you can easily chat with the developer, the veterans and all the other players. Dont hesitate to ask if you have any questions, there is a lot of kind and knowledgeable players that will help you out as soon as they can including myself. Dragon Overseer is a true indie game, I had no past proffesional experience from the gaming industry, and no publisher backing me up, it took me five years of fulltime development to realize my vision but now, when the budget and saved up money is spent, theres not much else for me to do than cutting down on the developing hours and returning to earn a living through other work. But as soon as the game can support my family I will be able to work fulltime on the game again! To support me in being able to spend more time developing the game, you can either invite your friends to the game or make a donation if you have a few coins to spare ofcourse! By using the minus and plus buttons you can choose how many action points you want to spend during your next training session, the maximum number you can spend each session is increased with the dragons level, every 5 levels you spend one more actionpoint in the training mode. Every training session concludes in you getting a score, this score determines how much the dragon learns meaning how many experiance points you will be rewarded. If you spent multiple actionpoints in one session, the amount of experience will be multiplied by the number of actionspoints you chose to spend. Used to change the dragons vertical position, letting you find ways to avoid the wyverns. During the training session you can pickup bonus stars along the way, all these stars are added together creating a bonus that increases your total score by a percantage when the flight is over. This percentage is shown to left of your current score. The score is continiously increased the further you progress. The score will be determined when your dragon is exhausted by colliding with wyverns three times. 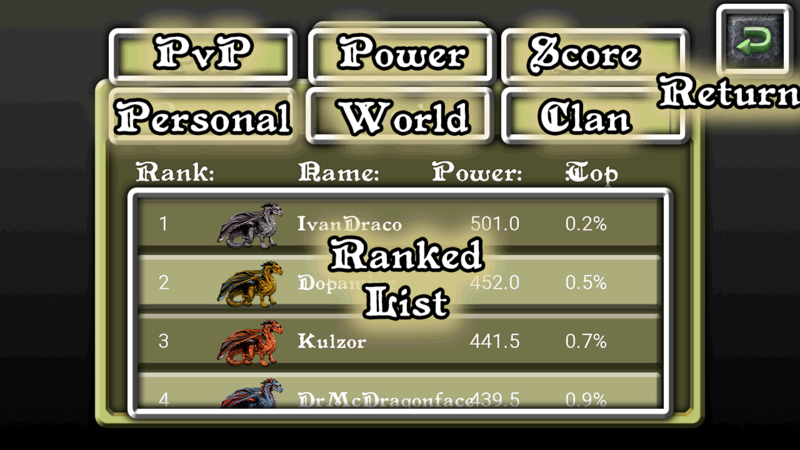 As long you can avoid colliding with these wyverns, the score will keep increasing. This Score doesn’t take in consideration the bonus stars youve collected, they will be applied in the final result. Launches a fireball directly in front of the dragon enabling you to clear a way through the wyverns. The count of available fireballs are increased over time. When you click start, the training begins and your dragon will start flying into the clouds of wyverns, your aim is to get the highest score possible and the score is continiously increased the further you progress. The score will be determined when your dragon is exhausted by colliding with wyverns three times. 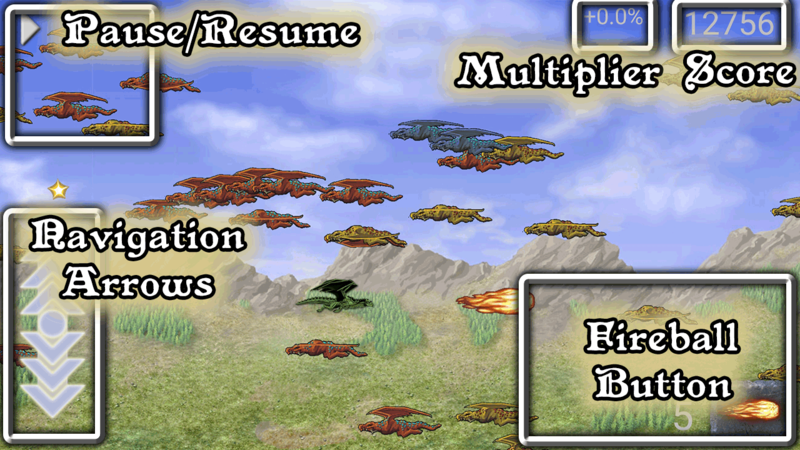 As long you can avoid colliding with these wyverns, the score will keep increasing. You can do this by either dodging the wyverns by using the movement arrows to change the dragons vertical position or by breathing fire by clicking the right-bottom portion of the screen and thereby clearing a way for the dragon to fly through. *Whenever your dragon attempts to either catch a creature or harvest a plant, you can view the details by holding your finger on the resultframe. *Whenever the dragon finishes a battle with a world boss, showing you what skill the dragon obtained or how much experience the dragon was awarded. *If the dragon has no more space in its inventory and thus failed to store the food. Shows the dragons remaining amount of Movementpoints, the amount of empty slots of your total and your current amount of gold. If you have no empty slots remaining you loose the food you just caught or harvested. Use these buttons zoom in or out, letting you overview a larger or smaller portion of the world on screen. There are multiple reasons to why your dragon should explore the world. To ensure your dragon learns faster and unlocks powerful traits, your dragons needs food, which can be retrieved from hunting creatures and gathering plants in the world, but the world also provides the dragon a way of getting stronger by battling other boss dragons, not only giving your dragon experience, but it can also obtain powerful skills by defeating these bosses. Every player has their own unique world, so its up to you to find its best locations for hunting, gathering and battling, and to unveil its mysteries. By using the navigation arrows in the bottom left you choose where you want your dragon to fly, to find creatures, plants and bosses they have to be inside the dragons vision, meaning the lit area around the dragon. The black fog hiding the terrain around the dragon indicates that your dragon has never visited that area before and will be unveiled by simply flying towards it. The game is turnbased so the world is divided into hexagons, needed to keep track of the dragons movement and thus amount of movementpoints consumed, so every time your dragon moves from one hexagon onto the next, your dragon consumes some of its movement points, your remaining amount of movement points are shown in the resource bar. To attempt to catch a creature, harvest a plant or engaging in a battle, you simply fly on top of it. whether your dragon was successfull or not will be shown in the top left portion of the screen. The amount of consumed movementpoints every time the dragon move onto another hexagon is by default 1mp , but the dragons agility affects this value in a positive way, reducing this amount allows the dragon to travel the same distance but consuming a lower amount of movement points, check out the agility attribute in the stats portion of the manual to get the intricate details. The Dragons vision called Light Radius affects the number of visible hexagons around the dragon. From start the dragon has a Light Radius of 3, this number represents the number of hexagons in any direction the dragon can see on the world map. The dragons vision along with this number can be increased by raising the mindfullness stat, your light radius number is rounded down, so you have to reach a value of higher than 4 to get your vision improved on the map. The success chance for catching creatures is determined by your dragons speed attribute, and the change for successfully harvesting plants are determined by your discipline attribute. But the successrate of both is also dynamic depending on the rarity of the creatures or plant you’re trying to catch or harvest. For every higher rarity the chance is dropped by some 30 percent (rough simplification). The percentual amount these chances are increased by every statpoint are decremental for each statpoint raised. All food retrieved from hunting and gathering has a quality, the chance of getting a high quality is determined by your dragons knowledge, the ability to pick out the best plants or knowing if a creature is sick or old. Knowledge affects the chance of getting a perfect quality and for every lower quality the chance is increased by 60%, for example your dragon has a chance of 10% to get a perfect quality, then it has 16% chance to get an excellent quality and 25,6% of getting a fresh food. There is always at least 5% chance of getting the lower qualities. By using the minus and plus buttons you can choose how many battle points you want to spend during your next pvp battle, the maximum number you can spend each session is increased with the dragons level, every 10 levels you can spend one more battlepoint in each battle. The winner of the battle drains his/her opponents soul dragon absorbing some of the opponents experiences, If you spent multiple battlepoints in one session, the amount of experience will be multiplied by the number of battlepoints you chose to spend. This is an upcoming feature, allowing the player to view the list of his/her total skills and to view the details of those skills. This mode will also later on be used when the player sets up their memorized skills, meaning the skills they choose to use in battles. By clicking this button you search for opponent players that has spent roughly the same amount of combined action, move and battlepoints. First search has an allowed difference of 5% and if the game fails to find any opponents within the range, it allows you to either retry or widen the search by doubling the allowed difference. This is an upcoming feature, allowing the player to challenge a specific dragon by its name. By checking the left box you are signing up in the arena and thereby allowing others to challenge you by searching the arena. By checing the right box you allow people to challenge you directly to friendly battles, the result from these battles does not affect your pvp score, this is only based on arena. This is your dragons current health and mana, the bars length indicates the maximum health/mana while the filler part indicates your current health/mana in relation the maximum health/mana. By clicking the bars, you can enable disable the specific values of your current health and mana. Your opponents Health and Mana is always unknown to the player. By clicking a dragon and holding down your finger you’ll get an overview list of the current skills affecting the dragons if any, an upwards green arrow indicates a positive effect while a downwards red arrow indicates a negative effect. 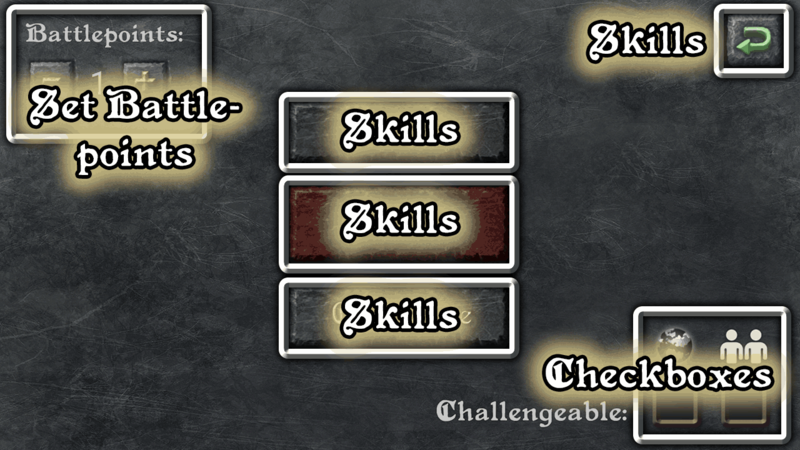 To get a full list where you can view details of each skill, you click the dragon to open an interactive list where you can scroll through the continious skills by draging your finger upwards/downwards. Press and hold on a skill of this list to show the skill details. Expand and contract the battlelog by simply clicking it. When you expand the log, it scrolls down to the most recent logs of the current turn. While expanded you can click and drag your finger to scroll back and fourth through the log history. 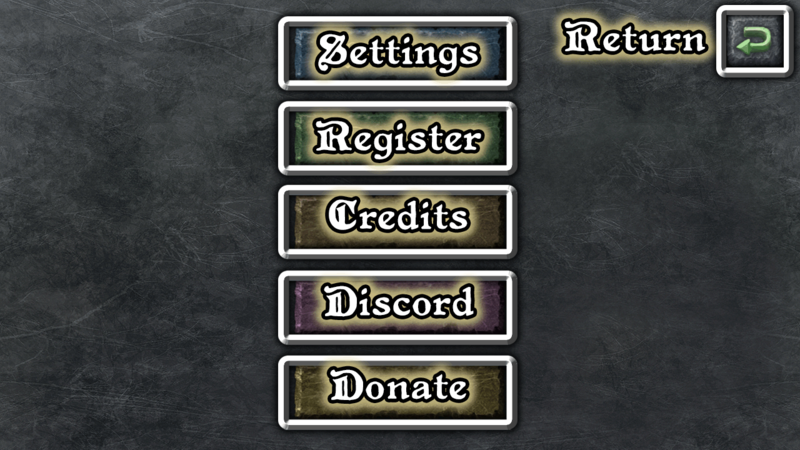 The skillbar is where the player chooses his/her next action for every turn. The left portion of the skills bar contains the action-timer showing the amount of remaining time the player has to decide upon an action, if no action is confirmed, the last selected skill will be used, If no skill was selected the default attack will be used. The timer is only active in PvP battles. 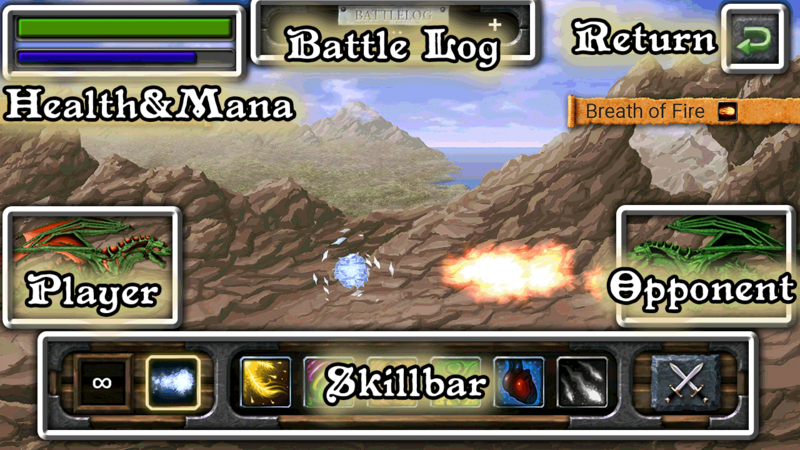 Next to the timer you have your default attack, the dragonbreath. In comparison to the skills, the default attack can used any number of times. The middle section of the skillbar is where all the available skills for dragon are listed, by clicking somewhere within this field and draging to the left and right you can browse through all available skills if there are many. By clicking and holding on a skill the skill-info window appears on screen explaining what the skill does and its values. To choose your dragons next action, simply click the skill you want to use, if the skill was properly chosen, the skill will be highlighted. Finally to confirm your dragons next action you use the right section of the skillbar which contains the confirm button, once clicked you have fully chosen your next action. Lets the player choose to concede and loose the battle to end it and thus being able to exit directly. The goal of every battle is to reduce your opponents dragon health to zero before your health goes to zero, then the dragon will faint giving you the opportunity to consume some of its experiences, the same goes for your opponent whether that be a player or an npc. there is no way for a players dragon to die. 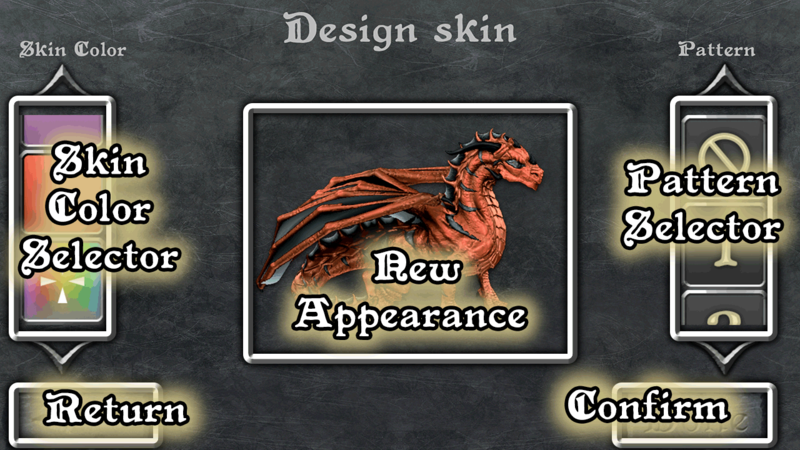 The dragons has a number of skills available each turn for the player to choose from. Some skills inflicts damage which reduces health either instantly or during multiple turns as a continious effect, which the player can view any time by clicking directly on the dragon affected. There are multiple strategies to victory, some of them are very risky and volatile while other strategies have a more stable and defensive approach. Each battle both dragon starts with their maximum health and 50% of their maximum mana. Dragons memory works a little slower and a bit more eratic than humans, so the dragons need time to remember all the skills it has memorized, but until the battle is fully engaged, the dragons manage to recall 4 of their skills at random but every even turn it recalls one additional skill. The Battle progress through multiple turns, each turn has 4 phases; Recall/Recover phase, Decision phase, Action phase and Effect phase. Every odd turn starts with a Recover phase, during this phase a dragon have a percentual chance to re-energize an already used skill. Every even turn starts with a Recall phase, in which the dragon recalls one of its not yet recalled skills, if any. During the Decision phase players or AI choose an action by either choosing a skill or the dragons default attack. When both players/AI has chosen an action, the Action phase begins: Both dragons execute their actions at the same time and the skill names will appear above each dragon. A skill can either be a spell or a projectile, if both dragon uses projectile skills, there is a chance of collision, if the projectiles collide, the dragon with the highest willpower will have the highest chance of obliterating the opponents projectile and continuing towards the target. After the visual effects of both dragons skills, the immediate results/effects will show up on the targets affected by the skills. These skill results/effects is accompanied with an icon associated with the battlestat affected. Some skills applies a continious effect that affects the target(s) during multiple turns but all the effects from all these continous skills are executed during the Effect phase. During the Effect phase all the continious skills active on the battlefield will execute at the same time but the results are presented visually to the players in order, to make it easier for the players to follow. The player can always skip through the action and effect phases. Finally the turn ends and the next turn starts. The chance of collision between projectiles is always fixed at 1/3 (33.3%). The success chance for each dragon is set in proportion to their willpowers in comparison, for example: dragon1 has 20 willpower and dragon2 has 30 willpower then the chances for succcess are 40% for dragon1 and 60% for dragon2. The winning projectile are weakened after collision, but the higher willpower in relation to your opponents the better the projectile preserve its power. the preserved power is calculated almost the same way as the success chances so with the previous example we would get 40% for dragon1 but here we also apply a random fixed value ranging from -10% to +10%, meaning the preserved power for dragon1 would be somewhere between 30-50% of its original power. The values of skills are determined by the dragons dragonforce and the duration by its magic persistance. The values are increased with the same amount for every point of dragonforce, unless the value is percentual. If the value is percentual and increase with power, the value increases with exponential decay, meaning its progressivly harder to increase the value by increasing dragonforce. the same goes for percentual values that decrease with power. The continious skills duration is also increases with exponential decay, meaning its progressivly harder to increase the value by increasing the dragons magic persistance. How much mana your dragon regenerate every turn depends mainly on your dragons mental endurance. The amount of mana regenerated is increased linearly along with your mental endurance. The dragons ability to regenerate mana is also enhanced by 15% when the dragon already has some amounts of mana flowing in its body but still has plenty of room for more. The threshholds for this bonuseffect is that the current amount of mana is over 33% and under 66% of maximum mana. The chance for a skill to hit your opponent during the action or effect phase is simply reduced by your opponents chance to dodge. A dragons chance to dodge is increases with exponential decay as the dragons dodge stat increases. The value(s) of the skill (if not constant) will be randomized between the interval(s) before any other modifier is applied. the minimum and maximum value of the dragons skills are determined by your dragons dragonforce. If a skill during any phase hits, it has a chance of getting a fortunate/critical hit, the chance is determined by the dragons opportunism, the chance increases with exponential decay as the dragons opportunism stat increases. If it was a fortunate/critical hit a dynamic multiplier will increase the rolled skillvalue, this multiplier consists of a base multiplier of 40% added with a value determined by the dragons opportunism, this value is linearly increased along with your opportunism. After the skill value has been rolled and potential fortunate/critical hit modifier has been applied the final resulting value that will affect the target has been determined with one exception, if the valuetype is damage, then the value will be reduced depending on the targets dragonsscale. Dragonscale partially prevents the dragon from critical hits, this means that is the value has a critical multiplier bonus, this bonus is reduced depending on the dragonscale of the target, the dragonscale neutralizes the critical multiplier with 67% effeciency, meaning that if the skillowners opportunism is the same as the targets dragonscale the critical bonus would be reduced by 33%, this only applies to damage values. Then the base defence reduction takes place. The base defence reduction is constant and will linearly increase along with your dragonscale, but the reduction can never be higher than 80% of the value, leaving atleast 20% of the value (before the base defence reduction). Lists the worlds best players in regards to player versus player battles , the dragons are ranked by their winrate as shown in the list. For a dragon to get a ranking in pvp, the dragon must atleast have completed 5 battles against other players. Lists the worlds best players in regards to Power, the power of a dragon is the value of the Physique, Mind and Spirit stats combined. Lists the worlds best players in regards to the highest score of a train session. This lists the dragons which are ranked closest to your dragons ranking in the currently selected category. This lists the absolute top players in the currently selected category. [planned feature] Lists and ranks the dragons of your clan in the currently selected category. Every element of the list presents the Rank, Appearance, Name, Category value and Top value of that Dragon. The top value refers to the percentage of the whole games population of dragons that share or has a higher ranking than you in the currently selected category. 10% meaning that you are amongst the 10% best players in that category. Click any of your traits to show the information regarding the trait. This window will reveal its name, level and a description. 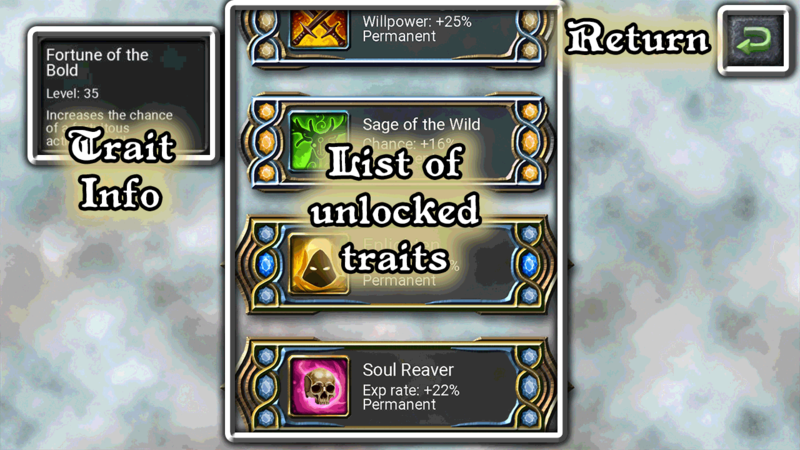 The level indicates traits power, the traits can be improved made more powerful by unlocking a higher level trait of the same type. Choose the color of your dragon by clicking the color in the color-list, to scroll downwards through all the colors simply click within the list and drag your finger upwards. The last color of the list is used to create your own color, when clicked, a color chart will appear letting you pick the color and saturation of that color. If you press inside the chart and hold, the new color will actively change while you drag your finger across the chart. Finalize the color by releasing your finger. Like any return button , returns to the previous screen. 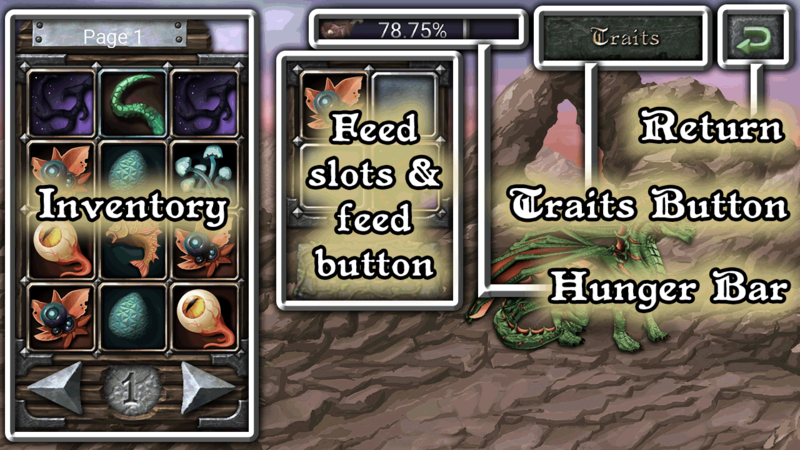 Shows the current choices you’ve made to your dragon, these are not applied unless the player press the confirm button. 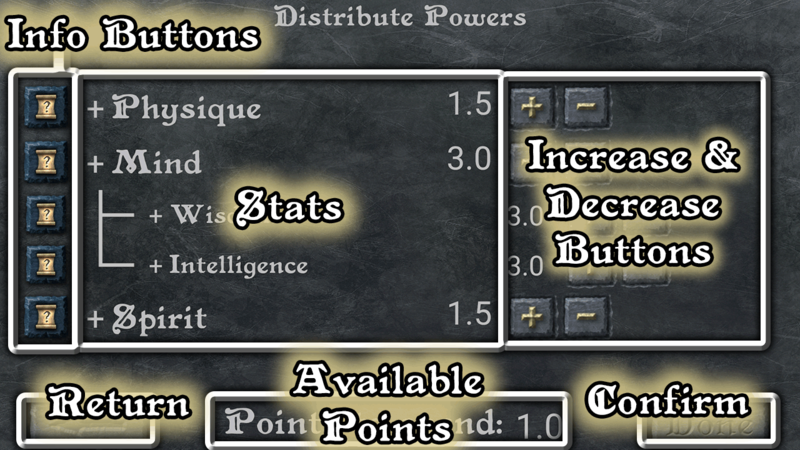 Opens the stat information scroll and opens the details surrounding the stat which info-button you clicked. You can navigate through all the different stats by clicking the substats to the stat you are currently viewing and using the small arrow to go up to its parent stat. close the scroll by clicking the red cross in the upper right corner. After opening this mode, the three main stats are showing, Physique, Mind and Spirit. By clicking any stat, the substats will appear below along with their own info, increase and decrease buttons. By clicking the same stat again you re-hide the substats. You can also open & close the substats of a substat in the same manner. Use the increase buttons to distribute your available points and undo that by using the decrease buttons. You can only decrease points that is not yet confirmed, old statpoints distributed from earlier sessions cant be undone. Close the mode without saving your changes and takes you to the previous screen. Shows your dragons not yet spent statpoints, every time your dragon reaches a higher level ,you are rewarded with 3 stat points. Applies the current stat distribution and takes you to the previous screen, these changes cannot be undone. All the 21 stats enhances your dragons performance in different aspects of the game, to read more about the stats open the Stat Information Scroll by clicking on the stats info buttons to the left. There are three levels of stats, main stat, sub stat and specific stat. The lower the level of the stat, the more specific part of the dragons abilities will be affected and a higher level stat will affect a more generic part (several) of the dragons abilities. The stats of the same branch are linked so for example when your raising a main stat, the substats and specific stats belonging to that mainstat will also be raised by the same amount. raising a mainstat costs one statpoint, raising a substat costs 0,5 and a specific stat costs 0,25 points. Whenever all the lower level stats belonging to a main or substat are raised you get a bonus to that sub or mainstat. The bonus can only trigger from points distributed during the current session, for example you cant trigger a bonus in a main-stat from raising one substat at one time and then the other substat part of the same main stat at another occation, those points must be distributed at the same occation to trigger the synergic effect which creates the bonus.